The textured print comes without glass in a simple walnut frame and is ready to hang. The overall print size is 25" x 18". 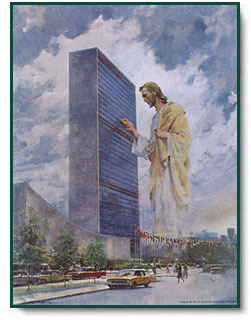 One of Harry Anderson's most popular prints, Prince of Peace depicts Jesus Christ knocking on the United Nations building in New York City and shows Christ's interest in the affairs of the nations. 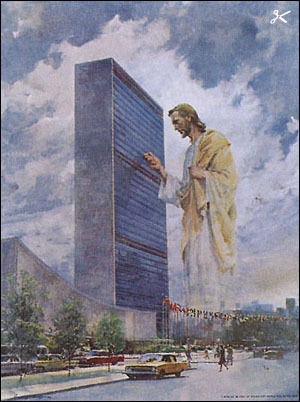 As the Prince of Peace, only He is able to bring true peace to all nations. Prince of Peace copyright© 1961 by Review and Herald Publishing Association.